Summer is a major catch 22 for me: I absolutely, whole-heartedly, all-consumingly love the sun. I’m sun smart enough to slather on tons of SPF, but the hot rays feel so gorgeously delicious on my warm skin I can’t get enough and soak it up more than I know I should. The catch? I guiltily know the UV damage is dangerous, and more immediately, making me uglier. Free radical cell damage is apparent in the form of unattractive discoloration, dark spots, wrinkles and sagging skin. At the very least, I prevent some of the damage with antioxidant and Vitamin C spiked serums, and undo some of the unsightly harm with skin firming lotions. Below, my top rated. 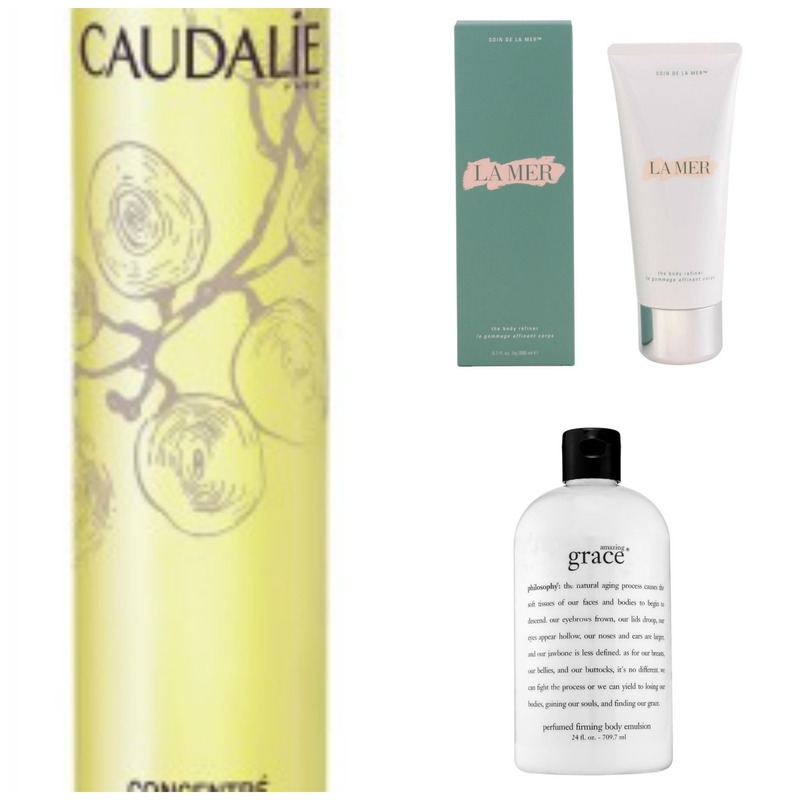 French favourite Caudalie is a rare gem of a brand, using only all natural ingredients that feel luxurious and truly deliver results. Their Contouring Concentrate, a slick, quick absorbing multi-oil elixir, promotes drainage and visibly smooths and contours skin. A tingly sensation sets in followed by kneading the product into problem areas and lets you know it’s doing its job. Yes, it’s a little (ok, a lot) pricey; all La Mer products are. The line is pure extravagance in more ways than one, though, and is absolutely worth every penny. Extracting super rare sea kelp from the depths of the Pacific, this twice-a-year harvest yields something so transformative, the doctor who founded the brand dubbed it “Miracle Broth”. Combined with a whopping 1.75 carats of diamond powder to gently retexturize skin and hydrolic acid to soothe and smooth, you’ll gladly shell out your hard earned cash for this dream cream again and again. Part delightfully scented body moisturizer, part seriously smoothing lotion, this cream packs a one-two punch and can be your new one and only. Beneficial antioxidants and Vitamins C and E tone and revitalize skin, while ultra moisturizing shea butter and natural oils deliver a soft, even result.